She sees the dead. He’s her last chance for a normal life. Will a desperate ghost ruin their romance? Caught between her gift to help the dead and her shot at happiness, Dori struggles to balance her two very different lives. Especially when the ghost becomes far too assertive to ignore. Will helping a troubled spirit cross over cost Dori her chance for true love? Girl in the Mist is the second book in the suspenseful Dori O. paranormal mystery series. If you like supernatural tales, fiery chemistry, and second chance relationships, then you’ll love Mary Castillo’s sensual novella. 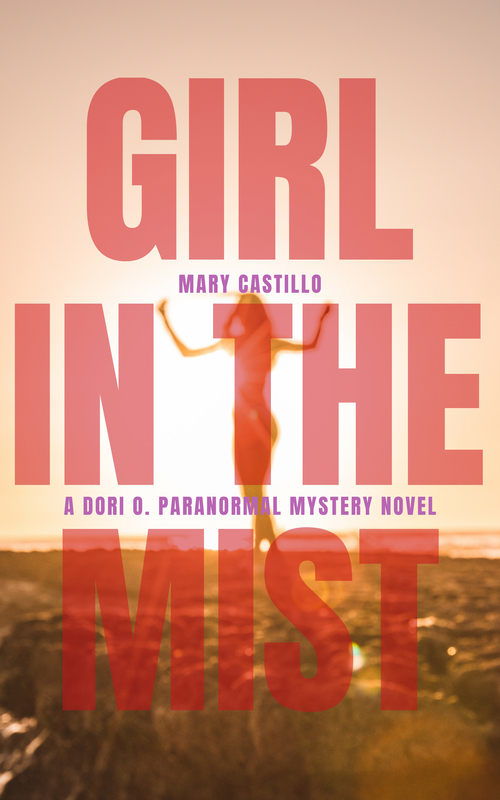 Buy Girl in the Mist to discover a supernatural secret today! A bellhop took them out of the lobby and across the street to a cottage hidden by overgrown hedges. A crooked river rock chimney reached up to the sky and green moss decorated the shingled roof. Adirondack chairs with colorful pillows were grouped around a brick fire pit. A path meandered alongside the cottage to a second, smaller one in the back. The bellhop opened the Dutch door. “Go on, check it out,” Gavin said. Dori walked inside while he tipped the bellhop and sent him away. Burning logs snapped in the fireplace and a bottle of champagne waited in an ice bucket. A bouquet of her favorite flowers, sweet peas that were so dark they were almost black, rested on the giant bed. Her chest went hot and tingly as she stood there taking it all in. He did this for her. The long drive. The lucky break finding her schedule and juggling his work crew and his daughter. He’d worked late last night. But he brought her here. No man had ever done something like this for her before, because, well frankly she never let one get past her defenses. When she hadn’t been paying attention, Gavin saw the romantic heart she kept hidden and had known just what would make her eyes fill up with tears. The door shut. She turned and saw that knowing grin of his stretched proud and unrepentant. “Oh shut up,” she said, looking away when her voice cracked under the strain of not crying in front of him. He got to work on the champagne while she stopped being such a girl. It only took 36 years for it to happen, but with one letter from him, Dori tripped and fell deeply, truly, completely in love. He had offered to buy her house and when she told him she was keeping it, he just smiled like he’d known she would do that. They spent every other weekend together unless Dori was on duty, or he had his six-year-old daughter, Bella, whom she still hadn’t met. Gavin respected her job and his laid-back, creative mind was the antidote to long days on the job. He even survived a cop barbeque without getting intimidated by her male colleagues who initially froze him out. He started talking with her sergeant’s wife and, before Dori knew it, Gavin was like an old friend of the family. Now when her colleagues invited her to barbeques, they always asked if Gavin was coming too.